From north-eastern Italy comes Broken Hearted, an atmospheric Goth metal band that places significant emphasis on creating the perfect ambiance to lure you into their musical world and hold you captive - only to release you and leave you begging for more. Formed in 2002 in Bolzano by drummer Mirko Montressor and guitarist Roberto Sieff, Broken Hearted has enlisted the talented singer Roberta Staccuneddu (Evenfall) to give voice to their lyrics, a task she performs superbly. 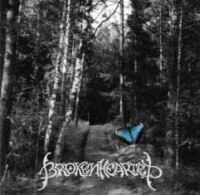 Containing 5 tracks, Broken Hearted's debut is an enjoyable blend of atmospheric doom metal and melodic metal, awash with lush keyboards and driven by meaty riffs. The chorus of "Close Your Eyes", the lead-off track, illustrates this point but it is "For You" that combines the best that the band has to offer. Written in memory of a friend lost to a tragic accident, the emotion is palpable as the sorrowful piano passages accentuate Roberta's passionate vocals. The song progresses through phases, including a wistful interlude featuring Roberta in a duet with clean male vocals, as it explores a journey of loss and remembrance. Roberta is joined by guest vocalists Stefan Fiori (Graveworm) and Claudio Pisoni (Skanners), who unleash a series of death growls and blackish rasps as Mirko pummels us with a crazed piano riff and thundering double-kick. The song is closed by a peaceful acoustic riff, and the listener is left with a glimpse of the loss experienced by the composer. "I Know What I Feel" holds the most "Gothic" feel of the demo due mostly to the addition of a cello and some spacey keyboards. Bassist Simone Faraon lays down some pretty hefty lines on this track, making his presence felt and increasing the intensity of the riffs. The demo is wrapped up with "Memories", a song that is more melodic than Gothic but retains the sense of loss that pervades the other four tracks. The ending of a friendship is the subject matter, and once again Roberta convinces us that she truly feels the words she's singing, allowing us as listeners to fully relate to her hurt. Mirko provides some interesting beat patterns, and the keyboards increase the overall feeling of sadness. This demo shows that Broken Hearted is a band that knows what musical direction they wish to take and proves that they have the musical talent and songwriting ability to stay the course. It is not clear whether Roberta will remain with the group or not, but the impact would be significant if she chooses not to. Fans who enjoy atmospheric Gothic metal with plenty of melody, similar to bands like Beseech and Leave's Eyes, should not hesitate to visit Broken Hearted's website and listen to their audio clips.